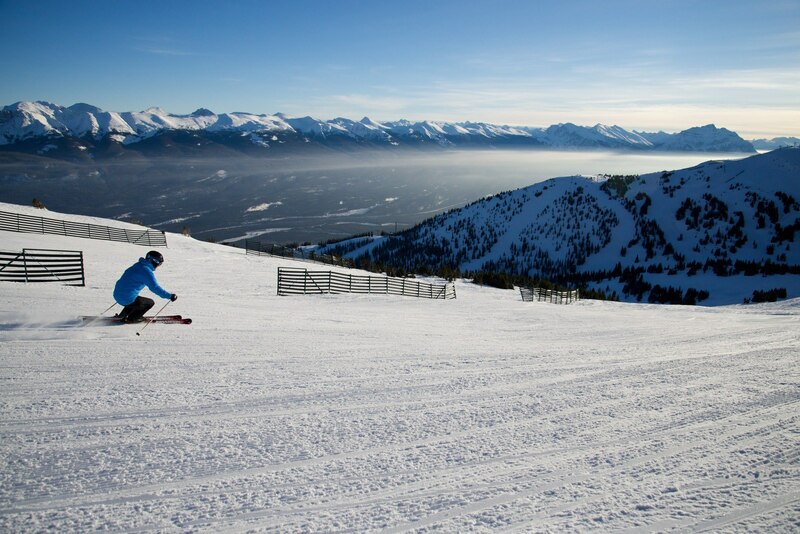 Marmot Basin: Situated in Jasper National Park, only 20 minutes from the authentic mountain town of Jasper, Marmot Basin offers 3,000 vertical feet of skiing and snowboarding spread over 1,675 acres of diverse terrain suitable for all abilities. Here you will find everything from long, perfectly groomed novice trails to high alpine bowls and steep chutes filled with dry, Rocky Mountain powder. Marmot Basin is one of the least crowded ski areas of its kind on North America, so there’s no waiting in lift lines. Lake Louise: Lake Louise is comprised of four mountain faces that create three distinct areas: the Front Face, the Back Bowls and the Larch Area. The trail map has an excellent synopsis of where different ability levels should head. If you want sun all day and want to ski the whole area, go to the Back Bowls in the morning, Larch midday and end up on the Front Face. Or perhaps take a free guided tour by the Ski Friends, a volunteer group, two times daily starting at Whiskyjack Lodge. Jasper Park Lodge – Situated in Alberta’s magnificent Jasper National Park, a UNESCO World Heritage Site, the iconic Fairmont Jasper Park Lodge resort invites you to experience our Great Canadian Lodge, surrounded by nature and abundant wildlife. The iconic Fairmont Jasper Park Lodge has undergone extensive multi-year, multiphase renovations which began in 2014. Chateau Lake Louise – Surrounded by soaring mountain peaks, the majestic Victoria Glacier and a glistening emerald lake, the iconic Fairmont Chateau Lake Louise hotel is located in Alberta’s Banff National Park, a UNESCO World Heritage Site, and is recognized globally for progressive environmental stewardship and responsible tourism.